The fat body is the central metabolic organ in insects. We present a live organ culture system that enables the user to study the responses of isolated fat body tissue to various stimuli. Chung, H. N., Rodriguez, S. D., Carpenter, V. K., Vulcan, J., Bailey, C. D., Nageswara-Rao, M., Li, Y., Attardo, G. M., Hansen, I. A. Fat Body Organ Culture System in Aedes Aegypti, a Vector of Zika Virus. J. Vis. Exp. (126), e55508, doi:10.3791/55508 (2017). The insect fat body plays a central role in insect metabolism and nutrient storage, mirroring functions of the liver and fat tissue in vertebrates. Insect fat body tissue is usually distributed throughout the insect body. However, it is often concentrated in the abdomen and attached to the abdominal body wall. The mosquito fat body is the sole source of yolk proteins, which are critical for egg production. Therefore, the in vitro culture of mosquito fat body tissues represents an important system for the study of mosquito physiology, metabolism, and, ultimately, egg production. The fat body culture process begins with the preparation of solutions and reagents, including amino acid stock solutions, Aedes physiological saline salt stock solution (APS), calcium stock solution, and fat body culture medium. The process continues with fat body dissection, followed by an experimental treatment. After treatment, a variety of different analyses can be performed, including RNA sequencing (RNA-Seq), qPCR, Western blots, proteomics, and metabolomics. In our example experiment, we demonstrate the protocol through the excision and culture of fat bodies from the yellow fever mosquito, Aedes aegypti, a principal vector of arboviruses including dengue, chikungunya, and Zika. RNA from fat bodies cultured under a physiological condition known to upregulate yolk proteins versus the control were subject to RNA-Seq analysis to demonstrate the potential utility of this procedure for investigations of gene expression. Mosquitoes are vectors of devastating human diseases, including malaria, dengue fever, chikungunya, and Zika1,2,3. Despite intense international efforts to curb these diseases and to control disease-transmitting mosquito populations, epidemic outbreaks of mosquito-borne diseases are still common, especially in developing countries. Effective vaccines against many of these diseases are either unavailable or of limited efficacy4,5. The most effective way to prevent outbreaks is to control mosquito populations, mainly through the use of insecticide treatments. However, insecticide resistance has developed in many mosquito populations and become a common problem around the world6,7,8. The study of mosquito physiology is essential to the development of novel tools and strategies to control disease. The mosquito fat body plays a central role in nutrient storage, metabolic homeostasis, reproduction, and xenobiotic catabolism9,10,11,12. It is the main storage organ for triglycerides, glycogen, and amino acids in form of storage proteins. It also functions as the location of synthesis for most hemolymph proteins and metabolites. In mosquitoes, the fat body is the sole source of yolk protein production that occurs in females after they take a blood meal13,14. The principal cell type of the fat body is the large, polyploid trophocyte or adipocyte3,9,10,12. Fat body tissue is organized into lobes or sheaths and can be found in all body parts of the mosquito, with the largest portion located in the abdomen, where large lobes of fat body are attached to the abdominal body wall. The mosquito fat body culture system presented here was developed in the '70s and remains a powerful tool for studying fat body physiology10, especially in combination with current analysis technologies. The foundation of this technique is based on the isolation of the abdominal body walls and the associated fat body tissue. The hydrophobic nature of the abdominal cuticle causes it to float on the surface of the culture medium, with the attached lobes of abdominal fat body immersed. The spiracles and tracheolar structure are maintained, ensuring oxygenation of the cultured tissue. Henceforth, we will refer to these preparations as "fat bodies." Isolated fat bodies remain viable for more than 12 h when incubated in the appropriate medium (unpublished results). Fat body culture is a valuable tool that has addressed a variety of questions regarding fat body endocrinology and physiology9,10,12,15,16,17. Cultured fat bodies can be subjected to various experimental and control treatments, the timing of which can be decided upon by the investigator. At the end of the incubation period, the fat bodies can be collected and processed for downstream analyses, including qPCR16,17,18,19, Western blotting18,20, proteomics21, or metabolomics22. Experiments can be performed on different scales, from individual fat bodies to groups of hundreds that can be cultured together. The representative results included here were derived from fat bodies cultured in the presence of amino acids and the steroid hormone 20-hydroxy ecdysone to simulate the blood meal activation of vitellogenesis16,17,23,24. We analyzed and compared the differential gene expression of not-activated versus activated fat bodies via next-generation sequencing analysis. Prepare a 4X amino acid stock solution23,24 by weighing and adding the 20 different amino acids to an Erlenmeyer flask according to the concentrations given in Table 1. NOTE: In some cases, amino acid(s) can be excluded from the solution and replaced by equal molar amounts of mannitol to maintain an equal concentration of osmolytes. Add the appropriate amount of ddH2O to produce the desired volume of solution. To ensure that the amino acids have completely dissolved, heat gently while continually stirring until the liquid is completely clear; it will take on a slight yellow hue. NOTE: It may be necessary to reduce the pH to 6 by adding HCl to allow some of the more hydrophobic amino acids to dissolve. Aliquot the solution and sterile-filter using a syringe filter with a 0.2-µm pore size. Store in a sealed container at -20 °C for up to 6 months. For the 20X salt stock solution, combine the salts listed in Table 2 in 50 mL of water. Stir until completely dissolved. NOTE: It may be necessary to slightly heat the solution to completely dissolve the salts. Sterile-filter using a syringe filter with a 0.2-µm pore size and store the solution in a 50-mL tube at -20 °C. For the 50X calcium stock solution, add 0.90 g of calcium chloride to 100 mL of water (Table 3); stir until completely dissolved. Sterile-filter using a syringe filter with a 0.2-µm pore size, aliquot the solution into 50-mL tubes, and store at -20 °C. For the Tris buffer, combine the salt and solutions listed in Table 4 and add ddH2O up to 100 mL. Sterile-filter using a syringe filter with a 0.2-µm pore size and aliquot the solution into 50-mL tubes; store at room temperature. To prepare the fat body culture medium, prepare all solutions listed above. Combine them as per the volumes in Table 5 to make 200 mL of fat body culture medium. Adjust the pH to 7.2 using NaOH or HCl. Sterile-filter the solution using a syringe filter with a 0.2-µm pore size. Divide the solution into 15-mL aliquots and store at -20 °C for up to 6 months. Prepare a stereomicroscope (10-20x magnification) with illumination and lay out two ultra-fine tweezers and a pair of micro dissection scissors. Prepare all solutions necessary for the experiment. Thaw the fat body culture medium to room temperature. NOTE: Precipitants can be dissolved by gently heating the solution to no higher than 30 °C. With an aspirator, collect adult female mosquitoes (3-7 days after emergence) and anesthetize them using carbon dioxide or ice. NOTE: Once anesthetized, the mosquitoes should be kept under CO2 for the shortest time possible, not exceeding 20 min. Alternatively, the mosquitoes can be anesthetized on ice and kept for approximately 30 min. Prepare a 6-well plate with 3 mL of APS per well. Focus the dissecting stereomicroscope and adjust the chair to a comfortable height. Place a concave microscope slide on the microscope surface and add two drops of APS to the center. Pick up a mosquito by a leg using a forceps and transfer it to the APS surface on the microscope slide. Carefully grip the mosquito by the thorax, with the forceps in the left hand, and rotate the mosquito so that the ventral side is upwards. While holding the body steady by the thorax, grasp the last two abdominal segments, with the forceps in the right hand, and gently pull. NOTE: The last two abdominal segments will separate from the abdomen and the attached ovaries, Malpighian tubules, hindgut, and midgut; sometimes the crop will slide out of the abdomen. If they have not been removed, insert the closed tips of the forceps into the small hole created and remove the remaining tissues. Set the right forceps aside and pick up the spring scissors. Slide one blade into the hole in the abdomen up to the segment below the thorax. Gently and swiftly cut the abdomen lengthwise. NOTE: Once the cut has been made, the abdomen should begin to expand outward, though this may not occur immediately. Proceed to make the second cut, which will be a lateral cut below the thorax and slightly below where the first cut ended. NOTE: The abdomen should then open up and dissociate from the thorax, with the cuticle up and the fat bodies side-immersed within the APS. This abdominal body wall is the fat body preparation for in vitro culture. Lift the fat bodies from the APS solution using the tip of a pair of forceps and transfer them from the solution to the 6-well plate containing APS at room temperature. Allow the tissue to rest for approximately 0.5 h before advancing to the fat body culture. Incubate the fat bodies on APS at room temperature for at least 0.5 h to equilibrate them. Transfer the fat bodies using the tip of the forceps and gently lift them out of the APS solution. Lower the tip into the fat body culture medium. NOTE: The fat body should open on the surface of the medium and float freely. The fat body culture is typically performed in 96-well plates, with 150-200 µL of medium in each well. One well can fit up to three individual fat bodies, and they are viable for more than 12 h (unpublished personal results). After the incubation period, transfer the fat bodies from the medium into 1.5-mL centrifuge tubes containing the appropriate reagents for downstream processing. NOTE: Typical analyses include qPCR16,17,18,19, Western blotting18,20, transcriptomics26, proteomics21, or metabolomics22. As an example, we performed a fat body culture experiment and stimulated isolated fat bodies by incubating them on a solution containing a balanced mixture of all twenty naturally occurring amino acids and the insect steroid hormone 20-hydroxy ecdysone (10 µM) for 6 h. As a control, fat bodies were incubated on APS for an equal amount of time. After incubation, the total RNA was isolated using a tri-reagent27 following the manufacturer's instructions. The quality and quantity of extracted RNA samples were assessed using a spectrophotometer, fluorometric quantitation, and agarose gel electrophoresis. RNA sequencing libraries were generated using 4 µg of total RNA and were quantified using two different techniques. Subsequently, the libraries were sent to a commercial provider for paired end-sequencing. The results of this experiment are shown in Table 6. Genes showing the strongest transcriptional response to amino acid and 20-hydroxyecdysone were primarily yolk protein genes, which is in agreement with previous results11. 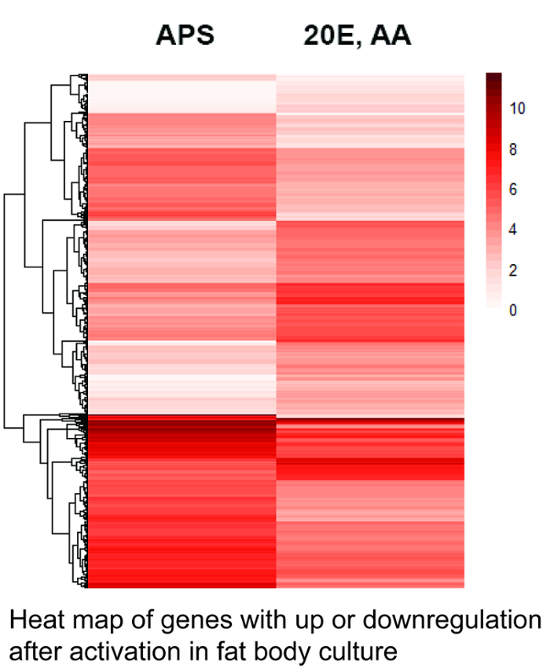 Figure 1 shows a heat map indicating the gene expression levels of 1,256 differentially expressed genes from cultured fat bodies after two different treatments. Figure 1. Heat map of genes expressed in the fat body culture. The heat map was calculated based on the number of specific transcripts for each gene in the different libraries using the heatmap package28 that is part of the R software environment. The darker shade represents higher gene expression. 1,256 genes with statistically significant variation in expression (Q-values < 0.05) are shown. The genes are ordered according to their averaged expression levels, indicated by the dendrogram on the left (not according to their phylogenetic relationships). Note the high number of genes with up- or down-regulated expression after stimulation with amino acids (AA) and 20-hydroxyecdysone (20E). APS = Aedes physiological saline. See Supplemental File 1 for a list of genes and their relative expression levels. Please click here to view a larger version of this figure. Table 1. 4X Amino acid stock solution. Table 2.20X salt stock solution. Table 3.50X calcium stock solution. Table 5. Fat body culture medium. Supplemental File 1. Please click here to download this file. Insect organ culture was used extensively to study insect endocrinology, development, and metabolism, as well as to investigate the interaction between specific organs and bacterial symbionts29,30,31,32,33,34. In vitro fat body organ culture was used specifically to study amino acid transport and the regulation of yolk protein production in mosquitoes and other Diptera16,17,35,36. During the process of vitellogenesis, the mosquito fat body uses an array of high-specificity amino acid transporters to import blood meal-derived amino acids from the hemolymph to synthesize large quantities of yolk proteins12,19,35,36. Fat body culture was instrumental to the delineation of the fat body nutritional requirements in this context18. The quality of the starting material, female mosquitoes, is critical for the success of these experiments. Mosquito larvae raised in under-crowded conditions and fed on high-nutrient diets usually produce the best results. There are some important variables to consider when establishing mosquito fat body culture conditions in the laboratory in terms of experimental design. We showed in previous studies that fat body gene expression varies significantly depending on the individual life history and nutritional status of the mosquito11,22. The mosquito culture conditions should be uniform to reduce the variability in the size and nutritional reserves of the experimental mosquitoes. In addition, personnel performing the dissections should be trained to ensure rapid and accurate dissections with consistent results. Cell viability in isolated fat bodies can be checked using different staining methods37,38. The experimental design of a fat body culture experiment should take into consideration the number of dissections possible in a given time period. When large quantities of fat bodies are required, multiple dissection sessions or multiple dissectors may be necessary. There is a wide range of future applications for in vitro fat body culture in mosquitoes and other insects. It will be especially useful for testing potential drug candidates for insect control. The use of transgenic techniques in insects to express specific reporter proteins in fat body trophocytes will open up new methods to develop powerful bioassays for the study of fat body physiology. This research was supported by NIH grant #SC1AI109055, the 2014 NMSU HHMI grant #52008103, and NSF PGR grant #1238731. We thank the participants of the NMSU Spring 2015 BIOL302 Molecular Methods class and Lavesh Bhatia for their technical support with the fat body culture experiments. Benelli, G., Mehlhorn, H. Declining malaria, rising of dengue and Zika virus: insights for mosquito vector control. Parasitol Res. 115, (5), 1747-1754 (2016). Newby, G., et al. The path to eradication: a progress report on the malaria-eliminating countries. Lancet. 387, (10029), 1775-1784 (2016). Clements, A. N. The Biology of Mosquitoes. 2, Chapman & Hall. London. (1992). Long, C. A., Zavala, F. Malaria vaccines and human immune responses. Curr Opin Microbiol. 32, 96-102 (2016). Mendis, K. N., David, P. H., Carter, R. Human immune responses against sexual stages of malaria parasites: considerations for malaria vaccines. Int J Parasitol. 20, (4), 497-502 (1990). Frings, S., Lindemann, B. Odorant response of isolated olfactory receptor cells is blocked by amiloride. J Membr Biol. 105, (3), 233-243 (1988). Froese, A., Szyszka, P., Menzel, R. Effect of GABAergic inhibition on odorant concentration coding in mushroom body intrinsic neurons of the honeybee. J Comp Physiol A Neuroethol Sens Neural Behav Physiol. 200, (3), 183-195 (2014). Yewhalaw, D., et al. Multiple insecticide resistance: an impediment to insecticide-based malaria vector control program. PLoS One. 6, (1), e16066 (2011). Arrese, E. L., Soulages, J. L. Insect fat body: energy, metabolism, and regulation. Annu Rev Entomol. 55, 207-225 (2010). Raikhel, A. S., Deitsch, K. W., Sappington, T. W. The Molecular Biology of Insect Disease Vectors: A Methods Manual. Crampton, J. M., Beard, C. B., Louis, C. Chapman & Hall. London. 507-522 (1997). Price, D. P., et al. The fat body transcriptomes of the yellow fever mosquito Aedes aegypti, pre- and post- blood meal. PLoS One. 6, (7), e22573 (2011). Hansen, I. A., Attardo, G. M., Rodriguez, S. D., Drake, L. L. Four-way regulation of mosquito yolk protein precursor genes by juvenile hormone-, ecdysone-, nutrient-, and insulin-like peptide signaling pathways. Front Physiol. 5, 103 (2014). Raikhel, A. S., Dhadialla, T. S. Accumulation of yolk proteins in insect oocytes. Annu Rev Entomol. 37, 217-251 (1992). Raikhel, A. S., et al. Molecular biology of mosquito vitellogenesis: from basic studies to genetic engineering of antipathogen immunity. Insect Biochem Mol Biol. 32, (10), 1275-1286 (2002). Hansen, I. A., Attardo, G. M. Ch. 6. Short Views on Insect Molecular Biology. Chandrasekar, R. International Book Mission. South India. (2009). Hansen, I. A., Attardo, G. M., Park, J. H., Peng, Q., Raikhel, A. S. Target of rapamycin-mediated amino acid signaling in mosquito anautogeny. Proc Natl Acad Sci USA. 101, (29), 10626-10631 (2004). Hansen, I. A., Attardo, G. M., Roy, S. G., Raikhel, A. S. Target of rapamycin-dependent activation of S6 kinase is a central step in the transduction of nutritional signals during egg development in a mosquito. J Biol Chem. 280, (21), 20565-20572 (2005). Attardo, G. M., Hansen, I. A., Shiao, S. H., Raikhel, A. S. Identification of two cationic amino acid transporters required for nutritional signaling during mosquito reproduction. J Exp Biol. 209, (Pt 16), 3071-3078 (2006). Carpenter, V. K., et al. SLC7 amino acid transporters of the yellow fever mosquito Aedes aegypti and their role in fat body TOR signaling and reproduction. J Insect Physiol. 58, (4), 513-522 (2012). Attardo, G. M., Higgs, S., Klingler, K. A., Vanlandingham, D. L., Raikhel, A. S. RNA interference-mediated knockdown of a GATA factor reveals a link to anautogeny in the mosquito Aedes aegypti. Proc Natl Acad Sci USA. 100, (23), 13374-13379 (2003). Hugo, L. E., et al. Proteomic biomarkers for ageing the mosquito Aedes aegypti to determine risk of pathogen transmission. PLoS One. 8, (3), e58656 (2013). Price, D. P., Schilkey, F. D., Ulanov, A., Hansen, I. A. Small mosquitoes, large implications: crowding and starvation affects gene expression and nutrient accumulation in Aedes aegypti. Parasit Vectors. 8, 252 (2015). Uchida, K., et al. Induction of oogenesis in mosquitoes (Diptera: Culicidae) by infusion of the hemocoel with amino acids. J Med Entomol. 38, (4), 572-575 (2001). Uchida, K., Ohmori, D., Yamakura, F., Suzuki, K. Changes in free amino acid concentration in the hemolymph of the female Culex pipiens pallens (Diptera: Culicidae), after a blood meal. J Med Entomol. 27, (3), 302-308 (1990). Hayes, E. Determination of a physiological saline solution for Aedes aegypti .(L). J Econ Entomol. 46, (4), 624-627 (1953). Price, D. P., et al. The Fat Body Transcriptomes of the Yellow Fever Mosquito Aedes aegypti, Pre- and Post Blood Meal. Plos One. 6, (7), e22573 (2011). Chomczynski, P., Mackey, K. Short technical reports. Modification of the TRI reagent procedure for isolation of RNA from polysaccharide-and proteoglycan-rich sources. Biotechniques. 19, (6), 942-945 (1995). Fujiwara, T., Kazawa, T., Haupt, S. S., Kanzaki, R. Postsynaptic odorant concentration dependent inhibition controls temporal properties of spike responses of projection neurons in the moth antennal lobe. PLoS One. 9, (2), e89132 (2014). Larsen, W. P. Growth in an insect organ culture. J Insect Physiol. 13, (4), 613-619 (1967). Judy, K. J., et al. Isolation, Structure, and Absolute Configuration of a New Natural Insect Juvenile Hormone from Manduca sexta. Proc Natl Acad Sci USA. 70, (5), 1509-1513 (1973). Marks, E. P. The action of hormones in insect cell and organ cultures. Gen Comp Endocrinol. 15, (2), 289-302 (1970). Hughes, G. L., Pike, A. D., Xue, P., Rasgon, J. L. Invasion of Wolbachia into Anopheles and Other Insect Germlines in an Ex vivo Organ Culture System. PLoS One. 7, (4), e36277 (2012). Postlethwait, J. H., Handler, A. M. Roles of Juvenile-Hormone and 20-Hydroxy-Ecdysone during Vitellogenesis in Isolated Abdomens of Drosophila melanogaster. J Insect Physiol. 25, (5), 455-460 (1979). Spielman, A., Gwadz, R. W., Anderson, W. A. Ecdysone-initiated ovarian development in mosquitoes. J Insect Physiol. 17, (10), 1807-1814 (1971). Boudko, D. Y., et al. Substrate specificity and transport mechanism of amino-acid transceptor Slimfast from Aedes aegypti. Nat Commun. 6, 8546 (2015). Fleischer, J., Bumbalo, R., Bautze, V., Strotmann, J., Breer, H. Expression of odorant receptor Olfr78 in enteroendocrine cells of the colon. Cell Tissue Res. 361, (3), 697-710 (2015). Jones, K. H., Senft, J. A. An improved method to determine cell viability by simultaneous staining with fluorescein diacetate-propidium iodide. J Histochem Cytochem. 33, (1), 77-79 (1985). Strober, W. Trypan blue exclusion test of cell viability. Curr Protoc Immunol. A3B, (2001).